Spring boating in the PNW. Gotta love it! My gosh, those are some truly intimidating circumstances! I would have been transfixed watching you operate under the stress. The 'flat clam' sounds delicious though!! Yeah, but it will eventually come back around to this..
GoneFarrell - that's a gorgeous shot! We stayed on one of the Town Floats there a couple weekends ago. Didn't sleep too well that night. We got "torpedoed" (my wife's description) by three must-have-been-very-large logs floating down current. BANG! That sound snapped me right out of whatever stage sleep I was in three times. Then on two other separate occasions, one of the props started spinning in the fast moving current making quite a low humming sound, again waking me right up. Found that I can't stop the shafts from spinning by putting the transmissions in either gear. Missed having a prop brake like I had on one of my sailboats. Fortunately, both of those incidents only lasted a couple minutes. 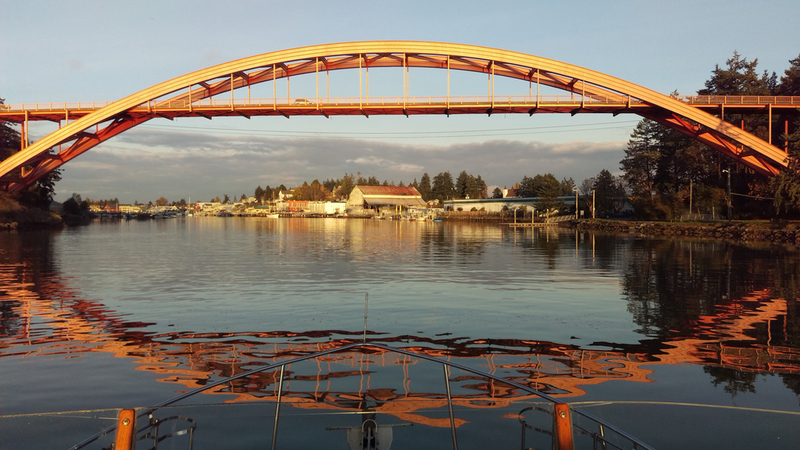 Last week we were lucky enough to get on the Swinomish YC reciprocal dock. First time in 5 years we've been able to snag a spot! But of course, we had only ever tried before during the busy summer seasons. Loved it. And no loud bangs or hums in the night! We do enjoy visiting La Conner, though. A very nice town. And the boardwalk is very cool! Thanks for the photo-props! The camera (or its operator) can't do justice to the glow off that bridge & water late afternoon. I got some stories trying to set anchor during a blow in PT, still one of my favorite places in the PNW. Maybe next time you visit try to get on the inside of the transient dock to avoid the torpedoes! That would get me out of the bunk fast as well. I'm in the north basin, but that is a longer walk to town. The weather instability I belive has to do mostly with the fact that we here in Puget Sound are not on the coast nor are we inland. The weather in the Aleutians isn't very stable either. The Bering Sea is 20 degrees colder than the Pacific Ocean. Winds scream across the islands at 100mph. In a mining camp in Alaska not too far from the coast they also have the same problem. In the winter at Nyac the men were going out to cut wood. Was 40 degrees. By noon even the eskimos were complaining about the cold and they almost never complain about anything. It was 40 below. They came home at noon to see the temp had dropped 80 degrees. A cold mass of arctic air from the interior of Alaska had just mooved west. Seattle is also near the coast (ocean) but not far away and ther geography just a few miles east is described as being very desert like because of the Cascade Mountians. So with different extreems nearby air masses tend to rush back and forth with the weather of the misty ocean coast one day and the clear blue skies of a desert the next. Oh yes then there's all the convergence zones where it gets all mixed up in the middle ... right about at Seattle or slightly better .. Everett. "The weather in the Aleutians isn't very stable either". Amen to that Eric. During Vietnam, we used to land at the Adak base for fuel sometimes in P3 patrol planes. More than once, we couldn't get out of there with the wind blowing 80 kts +. The fact that many of the buildings at that base are connected by tunnels tells the story. Ungodly weather in winter. Mr RT, Just remember that he invented the internet, so cut him some slack!